Served with field greens, French fries or potato chips. Substitute any burger for chicken upon request. All burgers fresh never frozen, served with your choice of French fries, field greens or kettle chips. Substitute any burger for chicken just ask your server! A 7oz grilled hamburger, topped with blue cheese crumbles, bacon, lettuce, tomatoes. A 7oz grilled burger, topped with sautéed peppers and onions, jalapeños, guacamole, pepper jack cheese, lettuce and tomatoes. A 7oz grilled hamburger topped with cheese, lettuce and tomatoes. A 7oz grilled hamburger topped with sautéed mushrooms, Swiss cheese, bacon, lettuce and tomato. A 7oz burger topped with our homemade Ellsworth cheese curds, triple berry or spicy ranch sauce, lettuce and tomato. 7oz burger topped with thinly sliced ham Swiss cheese, lettuce, tomatoes and Dijon mustard. Crispy chicken, lettuce, tomatoes, blue cheese, sweet chili glaze all wrapped in a warm giant tortilla. 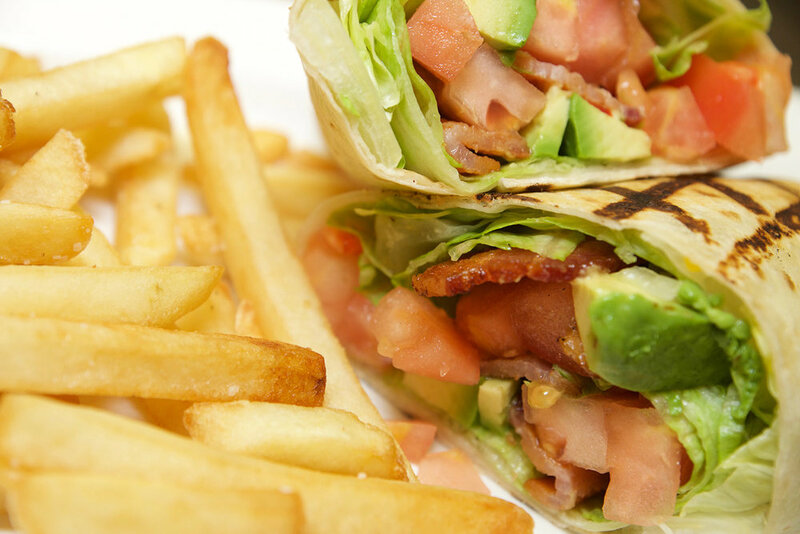 Bacon, lettuce, Avocado, tomatoes, and mayonnaise all wrapped in a warm giant tortilla. Grilled chicken, sauteed peppers and onions, lettuce, tomatoes and cheese all finished with our homemade southwest dressing. Roasted beets, sautéed peppers, onions, mushrooms, goat cheese and our homemade balsamic glaze in a warm giant tortilla.